I used to use this: https://addons.mozilla.org/en-US/firefox/addon/screengrab-fix-version/ for instantaneous, no scrolling necessary, full-page screenshots. It was fantastic. But with a recent Firefox update, the addon broke, and it is now slow, forgets your last save location, and doesn't even work half the time. 1. The (free) Firefox addon CAN instantly capture an entire page, (with watermarks) but it does NOT use the current ZOOM level. I often need to take screenshots that are zoomed in to 150%, even 200%. Does the paid version support this, or not? 2. 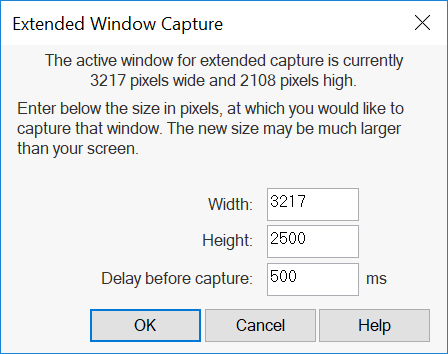 The (free) desktop app (Hypersnap 8)(Windows 10) DOES use the browser's current zoom level, but the "Extended active Window" feature always ASKS me how large I would like the final capture to be... meaning that I have to guess exactly how tall the full webpage actually is, and then manually input that number. Surely, there should be a way for Hypersnap 8 to automatically know how tall a webpage is, if virtually scrolled all the way to the bottom. Does that functionality exist in the paid version? 3. If I purchase Hypersnap 8 (desktop version), will that also include a license for the fully functional Firefox addon? There is no extra or better features after a purchase of a license, just watermarks are no longer added. The rest works just like it the version that you have downloaded already. I really don't know if and how it would be possible to capture the entire page, taking into account the current zoom level. If you wanted to, you could just capture the page at the default zoom with the add-on, then scale it e.g. 1.5x bigger in HyperSnap. But the result won't be as nice as the original scaling Firefox does, because it may draw e.g. the text with bigger font instead of just scaling page image. But it is possible to use the browser's current zoom level. Screengrab! is still able to do it. You can download it and test it out yourself, if you don't believe me. It used to be an option, but now it's always on by default. If Hypersnap 8 does not have this feature, I won't be able to purchase it. It's very important for me. I understand and I believe you. I don't know how they do it, maybe they simply scale the image by the current zoom level factor, same thing you could do easily in HyperSnap. If not, if they truly can make Firefox page rendering engine to render and the bigger zoom factor, it's great, but I don't have this knowledge. I can see that the source code of Screengrab! is available under Mozilla Public License, version 2.0. Could you look through it and figure out how they got the zoom level feature to work? I'm not suggesting that you copy the code outright. But I'm sure you'll be able to figure out what method they used. Alternatively, if you can't get the Firefox zoom feature to work, could you get an auto-window-sizing feature to work on the Hypersnap 8 desktop app? Is there a way to determine exactly how tall a (fully scrolled) webpage is, rather than having to ask the user every time? Actually, no add-ons for Firefox are needed anymore for this purchase - Firefox ships with good capture tool. 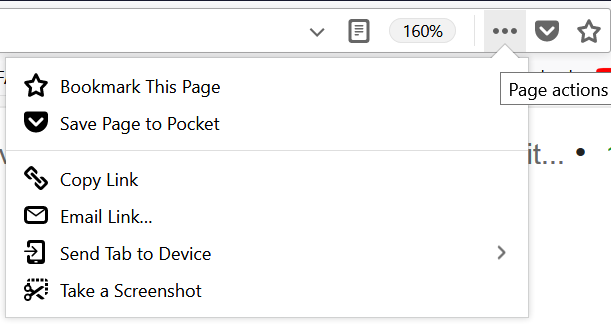 Press the 3 horizontal dots to the right of Firefox address bar - press "Take a screenshot" - then choose "Save full page" and you have it, with zoom etc. If anything, I should now cancel my own add-on as not needed anymore. I wouldn't be so hasty! I'm aware of that feature of Firefox. But it's also very slow to use. I don't see "take a screenshot" listed under the triple line menu. You have to press SHIFT F2, then type in "screenshot -- fullpage" , and then the screenshot is saved... SOMEWHERE. and no keyboard shortcut to begin the entire process. And finally, worst of all.... the method that they use for full page screenshots... doesn't always work. That's why your add-on still has value... if it CAN do those things. I also have Firefox 58.0.2. And again, there are no customization options for method or location of saving, auto-file-naming, a toast window, etc etc. But, it's better than nothing. So, is it possible for Hypersnap 8 (desktop) to know how tall a webpage is, without the user having to input a number manually? again, if you guys added that feature, it would make this a worthwhile purchase for me. I maybe could estimate how tall the page is by using the extension code again, that is sending some message to my Firefox extension, waiting for its reply... A lot of work to implement this and frankly I don't see any real need for all this work. Using the built-in feature of FF you may either save a PNG to your downloads directory or copy it, then paste it into HyperSnap or any other graphics software and save where and how you want. Like I said, their system still has a lot of problems. The only reason I was interested in Hypersnap, is because of its unique ability to easily take full-page website screenshots. For everything else related to screenshots, I use ShareX. It has far more customization options, and other features. I understand that it might be a lot of work to add the feature I am requesting. If you don't have it, and don't plan to add it, then my search will continue elsewhere. Or maybe not quite, looks like they have a limit of 10000 pixels vertical, it stopped there.